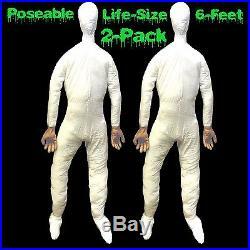 TWO BODY LOT PAIR SET – Cheap Halloween Prop Building Haunted House Decorations LIFE SIZE POSEABLE DUMMY MANNEQUINS DOLLS New Undressed Posable Soft Stuffed Adult Man Dead Body Horror Cosplay Costume Clothing Apparel Store Display Accessory with REALISTIC HUMAN HANDS – Each Six Feet Tall. TWO (2) BODIES LOT PAIR SET. 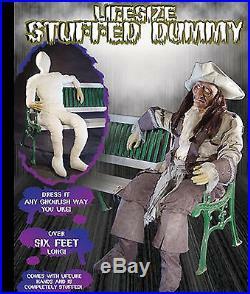 NEW LIFE SIZE POSEABLE STUFFED DUMMY WITH HANDS. HALLOWEEN PROP DECORATION APPAREL DISPLAY ACCESSORY. 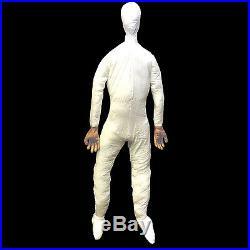 TWO – 6-ft Life-Size MAN POSEABLE MANNEQUIN DISPLAY DUMMY Halloween Costume Prop. Each 6-foot tall Halloween Haunted House Full-Size Adult Male Display Mannequin, has Soft Pliable Cloth Body and realistic lifelike flesh-tone rubbery plastic Hands. Dress him up for Christmas and holiday parties with a Santa or Elf suit, or dress him up as your favorite Grandpa Bob sitting in his favorite easy chair!! 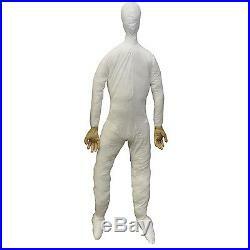 Soft Halloween Costume Prop Accessory with pliable cloth body, stuffed head and polyurethane hands. Flexible- You can dress and pose any ghoulish way you like! Opening in back allows you to add more stuffing, or recycle using old plastic grocery bags, which are free-of-charge, readily available, light in weight, and pack into all the nooks and crannies for a firmer dummy!! Opening in back allows you to adjust stuffing or add your own wire support, such as a coat hanger, not included. Must be supported to maintain a pose, either by leaning on furniture or another prop, table etc, or by adding wire or other supports to maintain a chosen pose. 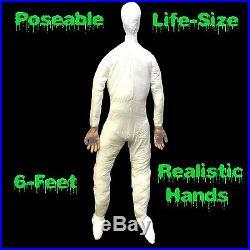 Full life size – 6-feet (72-inches or 180cm) Tall. 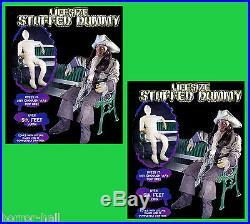 Life-Size Halloween Shop Display Party Store MANNEQUIN PROP DUMMY MAN. Need an extra body in your haunted house? Or the look of a man keeping company beside you in the car on a dark creepy night? Create your own inexpensive spooky props for Halloween, or any character display for every holiday or season of the year, with this squooshy soft MANNEQUIN. Makes a terrific low cost retail boutique model or portable craft show exhibit! Also suitable for Safety Demonstrations!!! Faux soft-stuffed person is flexible enough to be displayed in most positions. If you want it to stand, you would need to attach it to something, or insert wires, or pvc tubes, dowels or pipes. We have used clear 30-60 lb test fishing line to hang or support them. We have also used old non-working standing torch lamp bases with poles as supports for props, which we have gotten from garage sales & thrift shops. They already have weighted bases, and can attach another support pole to it with duct tape if not tall enough. Of course, if they are working lamps, you should not turn them on to prevent fire hazard. Add a mask or paint on a face. Dress up with hat, wig, gloves, shoes, costumes, old clothing.. Prop body in corner, chair, coffin, hang from wall, ceiling or doorway with fishing line for an extra spooky touch! Tip: After your event simply roll up and box while still dressed, and store for easy set-up each year. Add more stuffing for extra firmness. (Extra stuffing NOT included) We’ve used anything from packing peanuts, newspapers, or old plastic grocery bags! Answer: I would imagine you would have to attach it to a pole with inserted heavy-duty wire or insert pvc pipe or hardwood dowels for stiffness & stability. This is a soft stuffed figure, like a stuffed animal. I have used the stand & pole from old standing torchiere-style lamps I got from garage sales and thrift shops, as they already have tall poles attached to a weighted base. But because it’s soft-stuffed, you’d either have to add alot more stuffing to make it super-firm, or insert some type of supports in the body, legs and arms to withstand the extreme weight you are talking about. For this Item, Please Note. Boxes, so please provide a physical address. YES- This item ships Worldwide!! 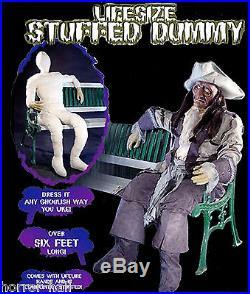 The item “2-PC-Life Size Body-STUFFED POSEABLE DUMMY-Halloween Haunted House Holiday Props” is in sale since Wednesday, May 15, 2013. 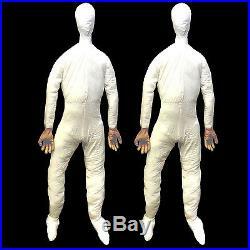 This item is in the category “Clothing, Shoes & Accessories\Costumes, Reenactment, Theater\Other Theatrical Clothing”. The seller is “horror-hall” and is located in Charlotte, North Carolina. This item can be shipped worldwide.